Huawei is huge in China, but their footprint in the US smartphone market is tiny, and not helped because they tend to be on the low end of any carrier lineup they do manage to snag. That ends today, as the company is now selling directly to consumers in the United States for the first time. The Ascend Mate 2, a big-screen, big-battery midrange phone, is up for pre-order on GetHuawei.com. The unlocked GSM-LTE phone is going for $299 in black and white color options. For three Benjamins, you get a phone with a gigantic 6.1" screen, a 3900mAh battery (down slightly from the one at CES) rated at 25 hours of talk time, a 13 megapixel rear camera with a 5MP front-facing cam, and... well, that's about it. You've got to cut some corners to get the price down, and the Ascend Mate 2 does indeed have some drawbacks, starting with the 720p screen. Combined with its large size, that leaves a DPI of just 240. The phone runs on a relatively light Snapdragon 400 processor, but it does have 2GB of RAM, which should let it run most non-intensive apps just fine. Storage is 16GB with a MicroSD card slot, and the phone will run Android 4.3 at launch with Huawei's Emotion UI overlay, and yes, it has access to the Google Play Store. All in all, it's a solid alternative to a Nexus or other unlocked phone if you value price, screen size, and battery longevity over raw hardware power. Huawei is selling the Ascend Mate 2 with a Net10 (AT&T MVNO) SIM card, which comes with a free month of service after an instant $50 discount. They'll also toss in a free case and 20GB of Bitcasa storage. Huawei's press release doesn't say exactly when the Ascend Mate 2 will ship, but since the pre-order bonuses end on June 22nd, we'll assume that's the date for the planned rollout. PLANO, Texas, June 12, 2014 /PRNewswire/ -- Huawei, a leading global information and communications technology (ICT) solutions provider, today made the Huawei Ascend Mate2 4G LTE available for pre-order in the U.S., exclusively through the company's new ecommerce site, GetHuawei.com. Together, GetHuawei.com and the Ascend Mate2 offer consumers a smart way to purchase their next smartphone: A convenient online shopping experience with exclusive deals, premium services, and a great, unlocked device at an accessible price - $299 USD. "This year, Huawei is ready to challenge the status quo by delivering premium experiences, well-made and well-priced devices in a totally new way," said Mr. Zhiqiang Xu, President of Huawei Device USA. GetHuawei.com is a new venture for Huawei Device USA. 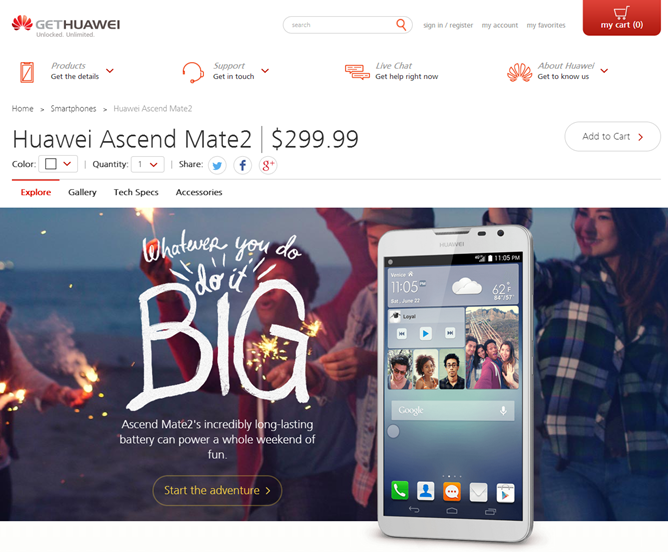 The site offers consumers an opportunity to purchase the unlocked Ascend Mate2 and take advantage of special offers and premium services exclusive to GetHuawei.com customers. For the launch of the Ascend Mate2, consumers who pre-order a device between now and June 22 will receive a SIM card with a free month of service and an additional bonus – a phone case to protect their Ascend Mate2. In addition to the SIM card and phone case, consumers purchasing an Ascend Mate2 will also receive lifetime 20GB of online storage free from Bitcasa. "With the Ascend Mate2, you just pop your SIM card in and you are ready to go," Mr. Xu said. "No need to worry about contracts or restrictions. You get a 4G LTE-ready device right out of the box." Announced at the Consumer Electronics Show this year, the 4G LTE-enabled Ascend Mate2 was designed with today's constantly connected consumer in mind. "We put everything we know into the Mate2," Mr. Xu said. "This device has what it takes to help you live large: big power, big screen, big camera. The Mate2 has more of everything you want in a smartphone." Or, listen to 100 hours of music. With a large 6.1-inch, Corning® Gorilla® Glass 3 IPS screen, and lightning-fast LTE Cat4 connectivity, the Mate2 is perfect for non-stop entertainment. The 13-megapixel BSI rear-facing camera, features a 2.0 aperture, making it easy to take crystal clear, professional-quality photos. Turn the phone around and its 5-megapixel front-facing camera, offers both panoramic mode and Auto Face Enhancement, so you get a wider view to help you create amazing selfies and groufies. "We're going beyond the idea of great selfies to deliver something new," Mr. Xu said. "After all, your life is big, the Mate2 is big, so your selfies and groufies should be big too. Our panoramic feature turns everyday groufies into something epic." Running Android™ 4.3, the Ascend Mate2 comes in black and white, and features Huawei's proprietary Emotion UI 2.0 Lite, for easy customization. Despite the large screen, the Ascend Mate2's 9.5mm slim shape, and the ergonomic designed casing make it comfortable to hold and operate. 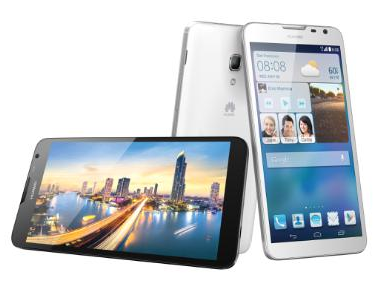 To learn more about the HUAWEI Ascend Mate2 4G LTE, visit GetHuawei.com.